Diego Rodríguez de Silva y Velázquez (; also UK and US ; Spanish: ; baptized on June 6, 1599 – August 6, 1660) was a Spanish painter who was the leading artist in the court of King Philip IV and one of the most important painters of the Spanish Golden Age. 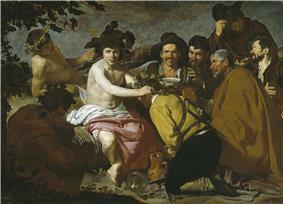 He was an individualistic artist of the contemporary Baroque period, important as a portrait artist. In addition to numerous renditions of scenes of historical and cultural significance, he painted scores of portraits of the Spanish royal family, other notable European figures, and commoners, culminating in the production of his masterpiece Las Meninas (1656). 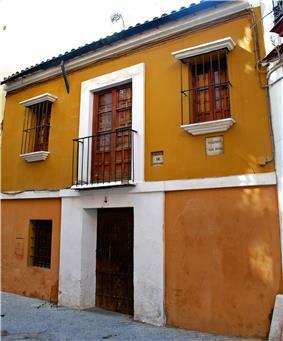 Born in Seville, Andalucia, Spain, Velázquez, the first child of João Rodrigues da Silva and Jerónima Velázquez, was baptized at the church of St. Peter in Seville on Sunday, June 6, 1599. This christening must have followed the baby's birth by no more than a few weeks, or perhaps only a few days. 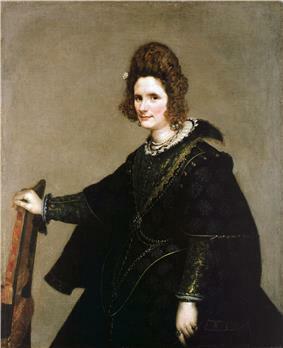 Velázquez's paternal grandparents, Diego da Silva and Maria Rodrigues, had moved to Seville from their native Portugal decades earlier. 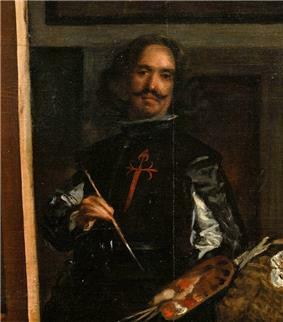 When Velázquez was offered knighthood in 1658, he claimed descent from the lesser nobility in order to qualify, but in fact his grandparents were tradespeople, and possibly Jewish conversos. As for João Rodrigues da Silva and his wife, both were born in Seville, and were married, also at the church of St. Peter, on December 28, 1597. 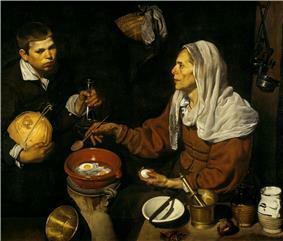 Vieja friendo huevos (1618, English: Old Woman Frying Eggs). National Gallery of Scotland, Edinburgh. Portrait of the Infanta Maria Theresa, Philip IV's daughter with Elisabeth of France. In 1629, he went to live in Italy for a year and a half. 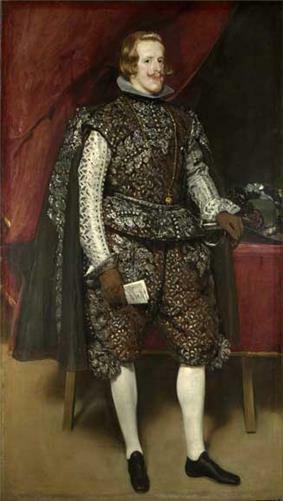 Though his first Italian visit is recognized as a crucial chapter in the development of Velázquez's style – and in the history of Spanish Royal Patronage, since Philip IV sponsored his trip – we know little about the details and specifics: what the painter saw, whom he met, how he was perceived and what innovations he hoped to introduce into his painting. 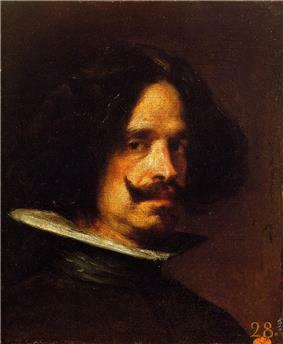 It is canonical to divide the artistic career of Velázquez by his two visits to Italy, with his second grouping of works following the first visit and his third grouping following the second visit. This somewhat arbitrary division may be accepted though it will not always apply, because, as is usual in the case of many painters, his styles at times overlap each other. 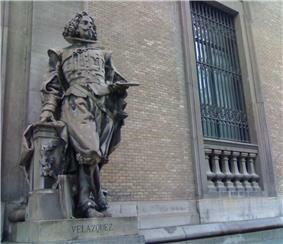 Velázquez rarely signed his pictures, and the royal archives give the dates of only his most important works. Internal evidence and history pertaining to his portraits supply the rest to a certain extent. The sculptor Juan Martínez Montañés modeled a statue on one of Velázquez's equestrian portraits of the king, painted in 1636, which was cast in bronze by the Florentine sculptor Pietro Tacca and which now stands in the Plaza de Oriente at Madrid. The original of this portrait no longer exists, but several others do. 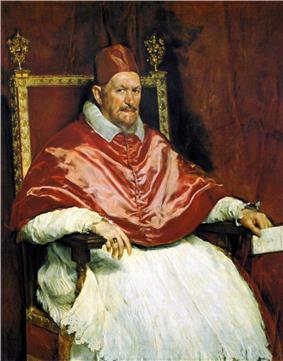 Velázquez, in this and in all his portraits of the king, depicts Philip wearing the golilla, a stiff linen collar projecting at right angles from the neck. It was invented by the king, who was so proud of it that he celebrated it by a festival followed by a procession to the church to thank God for the blessing. Thus, the golilla was the height of fashion, and appeared in most of the male portraits of the period. Portrait of Juan de Pareja (c. 1650). 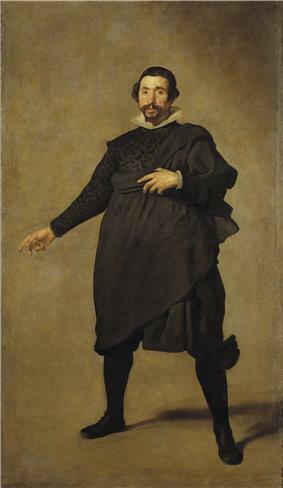 Portrait of Pablo de Valladolid, 1635, a court fool of Philip IV. 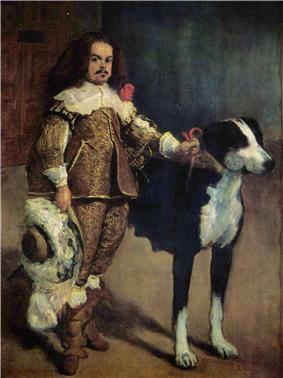 Velázquez also painted several buffoons and dwarfs in Philip's court, often with respect and sympathetically, as in The Favorite (1644), whose intelligent face and huge folio with ink-bottle and pen by his side show him to be a wiser and better-educated man than many of the gallants of the court. Pablo de Valladolid (1635), a buffoon evidently acting a part, and The Buffoon of Coria (1639) belong to this middle period. Detail of Las Meninas (Velázquez's self-portrait). 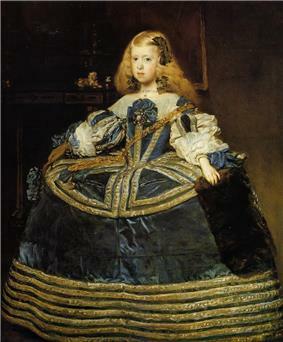 Portrait of the eight-year-old Infanta Margarita Teresa in a Blue Dress (1659). The importance of Velázquez's art even today is evident in considering the respect with which twentieth century painters regard his work. Pablo Picasso presented the most durable homages to Velázquez in 1957 when he recreated Las Meninas in 58 variations, in his characteristically cubist form. Although Picasso was concerned that his reinterpretations of Velázquez's painting would be seen merely as copies rather than unique representations, the enormous works-including the largest he had produced since Guernica in 1937, obtained a position of importance in the canon of Spanish art. Picasso retained the general form and positioning of the original in the context of its avant-garde cubist style. 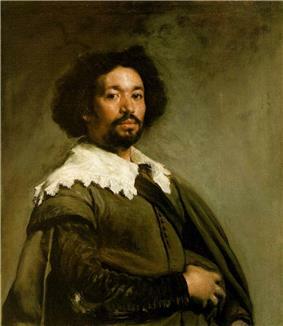 In October 2011 it was confirmed by art historian Dr. Peter Cherry of Trinity College Dublin through x-ray analysis that a portrait found in the UK in the former collection of the 19th-century painter Matthew Shepperson is a previously unknown work by Velázquez. The portrait is of an unidentified man in his fifties or sixties, who could possibly be Juan Mateos, the Master of the Hunt for Velázquez's patron, King Philip IV of Spain. The painting measures 47 x 39 cm and was sold at auction on December 7, 2011 for £3,000,000. ^ "Juana and Diego Velazquez Marriage Profile". Marriage.about.com. Retrieved December 22, 2010. ^ The manumission document was discovered by Jennifer Montagu. See Burlington Magazine, volume 125,1983,pages 683-4. ^ Bird, Wendy. "The Bobbin and the Distaff", Apollo, 2007-11-01. Retrieved on May 28, 2009. ^ a b Kunsthistorisches Museum, Wien "Infantin Margarita Teresa (1651-1673) in blauem Kleid | Diego Rodríguez de Silva y Velázquez | 1659 | Inv. No. : GG_2130" Retrieved on January 27, 2014. ^ a b Kunsthistorisches Museum, Wien "Infant Philipp Prosper (1657-1661) | Diego Rodríguez de Silva y Velázquez | 1659 | Inv. No. : GG_319" Retrieved on January 27, 2014. ^ Giles Tremlett in Madrid (July 1, 2010). "Yale basement yields Spanish treasure – a possible Velázquez masterpiece". The Guardian (UK). Retrieved December 22, 2010. ^ Louise Jury (27 October 2011). "Portrait in hoard sent to auction revealed to be £3million Velázquez". London Evening Standard. Retrieved October 27, 2011. ^ Wilkinson, Isambard (December 7, 2000). 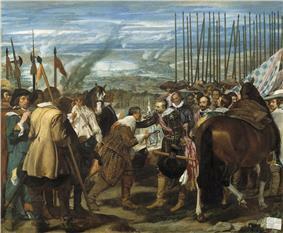 "Spanish to put car park over Velazquez". The Daily Telegraph (London). ^ Vogel, Carol (September 10, 2009). "An Old Spanish Master Emerges From Grime". 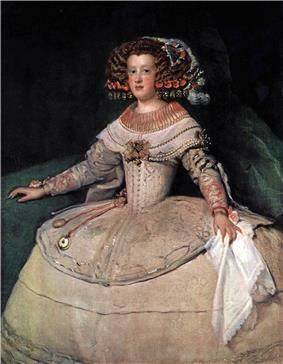 ^ Kunsthistorisches Museum, Wien "Infantin Margarita Teresa (1651-1673) in rosafarbenem Kleid | Diego Rodríguez de Silva y Velázquez | um 1653/1654 | Inv. No. : GG_321" Retrieved on January 27, 2014. Brown, Dale (1969). The World of Velázquez: 1599–1660. New York: Time-Life Books. Calvo Serraller, Francisco (1999). Velázquez:. Madrid: Electa. Domínguez Ortiz, A., Gállego, J., & Pérez Sánchez, A.E. (1989). Velázquez . New York: The Metropolitan Museum of Art. en un simposio en Sevilla"Velázquez"Enriqueta Harris resalta la 'pasión británica' por (PDF). El Pais Digital. Archived from the original (PDF) on October 24, 2004. Retrieved April 9, 2005.